Getting to Auschwitz turned out to be quite the adventure. We were supposed to be picked up at 8:30am but due to black ice there where some bad traffic jams so it was not until 9:20 that we were actually in the car. The road out of Wroclaw was so bad that a drive that normally would take 10-15 minutes now almost took 2 hours. Then it took another 2 hours on the highway before we arrived at Auschwitz. We had booked a guided tour for noon but we called on the way to check if we could postpone it for later. The museum closes at 3pm but if you are with a tour guide you could stay longer so we booked a 2pm slot. It was a “personal tour” so it was just the 5 of us–Maciej’s sister joined us. It was not allowed to take pictures so the ones I’ve taken and posted below I took from the parking area. 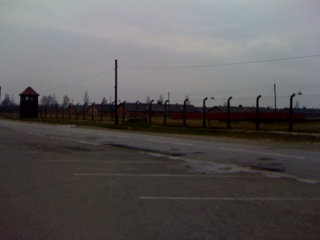 Those are of Auschwitz II – Birkenau which was the largest of the two camps. We went there first and was shown the two types (sleeping and toilet/shower) baracks. 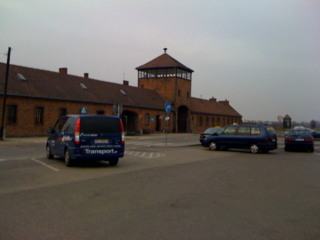 Then we went to Auschwitz I where the main museum is located. It was a lot of “graphic” pictures and actual items, and personally I think seeing all the hair–they shaved the heads before the gas chambers and then sold off the hair to textile companies in Germany–was very horrifying. Just thinking that that was “just” the hair that was left when the camps was liberated is mindblowing. Same thing with all 40 000 shoes that was in big piles on both side of a room. Seeing all those makes the number of 1.1 million dead very creepy. Lastly we went to the wall of death and then into the first of the gas chambers. Everything inside the gas chamber was reconstructed but you really got a weird and sad feeling walking in there remembering what horrific events have occured here.